I've been pretty happy with Windows 7 RTM so far, but one annoyance that took some time for me to resolve was getting ffdshow to decode my H.264 videos. Because Microsoft now natively support MPEG-4 AVC, it is very difficult to get Windows Media Player 12 to use another codec, such as ffdshow. This is quite annoying (for example) if you're used to watching Matroska (.mkv) files that have embedded subtitled, which ffdshow will quite happily display. I also want to use 64 bit codecs, seeing as I'm using Windows 7 x64. It doesn't help that there's a lot of crap posted on the internet, such as scripts that modify registry keys or files in the release candidated that are now controlled by TrustedInstaller in RTM. The easiest ways to set the default filter in WMP is to use the Preferred Filter Tweaker for Windows 7. I know some people (e.g. shark007) don't approve of this, but this is the simplest way to do it and - importantly - it works. There is a 64 bit version of Haali's Media Splitter. No it's not linked on his page, but it can be grabbed off his website. It's right here and it seems to work fine. You need the 32 bit version of ffdshow for 32 bit applications and the 64 bit versions of ffdshow for 64 bit applications. I've chosen to use the generic and 64-bit SVN builds by CLSID. There's also an icl10 version that uses SSE, which should be slightly faster, but they appear to be older builds. Once you've installed the splitter and codecs, run the filter tweaker and select ffdshow (don't forget to choose ffdshow in the 64-bit section halfway down if you plan on using the x64 version of WMP). Set the "(Default)" subkey to "%ProgramFiles%\Windows Media Player\wmplayer.exe" (this was already set on mine, probably after running the /SwapTo:64 command above). Set the "Path" subkey to "%ProgramFiles%\Windows Media Player"
After doing all of that, you should now be able to watch Matroska files using the x64 version of WMP using x64 codecs. Then reset the registry key values i.e. add the (x86) bit back in. 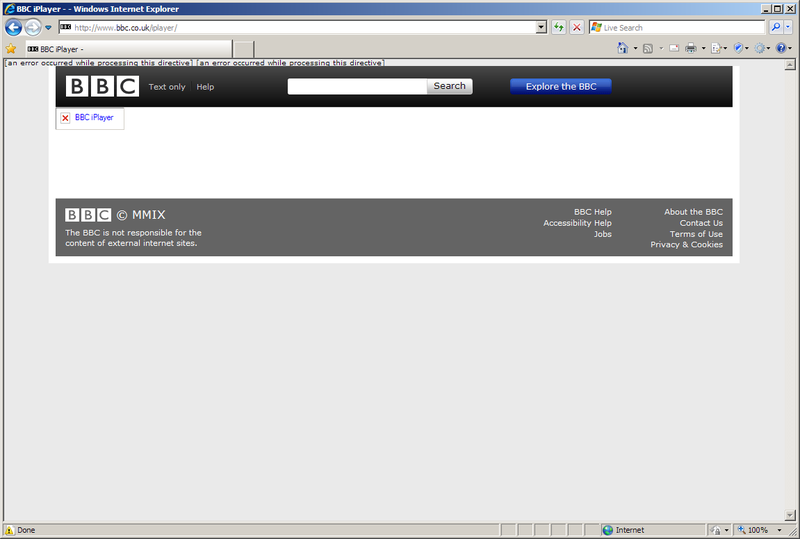 It looks like the BBC are having problems with iPlayer. That looks like an apache error to me: an error occurred while processing this directive. Recently our cat Squeaker has been after my attention. Instead of being content sitting at the bottom of our garden, she now expects me to sit in the garden with her. If I try and go inside, she'll stand up and walk to the back door and stare at it until I feel guilty and go outside again. Sometimes we'll play with some grass or a leaf (she's not into cat toys). This would be fine except we have a second cat. Moe also likes attention and being around people (and being around Squeaker). Unfortunately, Moe also appears to get very jealous. If I'm waving (because I do that) at Squeaker, Moe will tend to attack her. If I'm playing with some grass with Squeaker, Moe will jump in and take over. If I'm stroking Squeaker with my back to Moe, he'll often jump and climb up my back until he's standing on my neck. If I try and protect Squeaker (because she has a broken tail at the moment), Moe will attack me instead. If I trap Moe in the "kitty room" and go back in the garden with Squeaker, I can see him giving me evil stares from the window. They're both lovely cats (although I wish Squeaker was more affectionate in a traditional way, and I wish Moe was less affectionate at times), but they can be very annoying at times. I've recently had the Hugo Boss Orange advert's music stuck in my head (Drive My Car by The Hot Rats). That "beep beep" bit is especially catchy. It also has Sienna Miller in it (you can watch the advert in HD if you find her attractive), pulling some funny faces and twirling around. Perhaps it cost them so much to hire her that they couldn't afford any writers? I've also been watching a lot of 4oD recently, which contains a load of adverts for the new Toyota Prius and B&Q. The latter's advert has been poorly encoded or corrupted as it makes horrible hissing/scratchy garbled sounds as it's playing (it happens on all of the 3 different computers I've tried). I'm so used to hearing it that when I watch Channel 4 (or 4+1 or More4 etc.) using Freeview that I've started making the hissing noises myself. Perhaps this is a sign that I've gone mad? It was nice to see Windows 7 natively supporting my Intel 965 graphics card (GMA X3100) with a WDDM 1.1 driver. It would have been nicer if the "Panel Fit" options actually worked. I decided to install World of Warcraft and lower the resolution to help increase the framerate. It looked fine, but everything was very small in the middle of my screen. It seems that the supplied Intel driver will ignore GPU scaling. They're probably not the only one, I read that ATI had similar issues with their early drivers. My workaround for the Intel problem was to install the Vista driver (the installer queried the older version over the newer version, but didn't seem to have a problem with me using the "wrong" OS). Sure, they're probably only WDDM 1.0, and they're an older version (7.15.10.1666 - I presume the major version was bumped up because of Windows 7, but the minor version is still a lot lower), but I can now play games at a lower resolution and see them displayed full screen rather than have a big chunky black border. On the downside, I can see some flickering on Flash adverts (but 4oD seems to work fine). I can't imagine the move from Vista to Windows 7 is that difficult, especially for an option that I'd imagine would be relatively simple to implement. I hope Intel sort this out by October. EDIT: The flickering appears to have gone away after restarting. Now I can't see any problems with using the Vista driver (but there's probably something I haven't spotted yet). I thought I'd let you know that, seeing as I haven't updated this blog in aaaages. I've been busy with work ever since I got back from a glorious two weeks of annual leave, the majority of it's been onsite work in (very noisy and cold) datacentres. One job even required me to become nocturnal, we started at 9PM and left at 5AM on one particular evening, causing my body to hate me for several days. It would have been sooner, but the damn kitten refuses to let me get much sleep. It's been a very long time since I last saw Blur live in concert. Since watching them perform at Birmingham's NIA sometime in the mid-90s, they've fallen out with Graham Coxon and subsequently created a terrible album. Thankfully, for reasons that still aren't too clear (much like why he left), Graham Coxon has reunited with the rest of Blur for some fantastic live performances. Their Glastonbury performance looked great on my high definition TV (I love you BBC HD), and unlike the BBC's usual fashion of screwing up the audio, it sounded great too. I was therefore very excited about seeing them at Hyde Park! What I didn't realise, as I stood in the blazing sun throughout Friday (the day when the real fans went to see them), was I'd have to wait several hours watching crap support bands. But it was totally worth it when Blur came on stage and struck the first few chords of She's So High. It would have been better if I hadn't been standing at the back corner of the venue in the line for the women's toilets (before you ask, I wasn't dressed as a woman, I was waiting in the queue with Cheryl). One absolutely fantastic gig later, I arrive home, exhausted but very pleased that I got to hear them play Advert live.